Tnank you for your interest in our product, we work for your satisfaction. We have greatest deals on 2-way radios and accessories! 35 Mile Range The MR350, under ideal conditions, gives you a range of up to 35 miles. Conditions vary with geography and other variables. 22 Channels The MR350 boasts 22 channels (including 7 NOAA channels). Emergency Alert Button When the alert button is activated, the radio transmits an alert siren followed by transmission of spoken or incidental sounds. This allows you to send the signal to other radios and warn of impending danger. Channel Scan Use scan to search the 22 channels for transmissions from unknown parties, to find someone in your group who has accidentally changed channels, or to quickly find unused channels for your own use. 121 Privacy Codes Interference Eliminator Codes help minimize interference by blocking transmissions from unknown sources. The MR350 features 121 codes for superior interference protection. 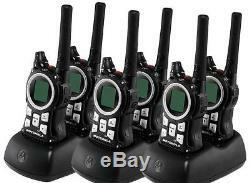 Included Items: 6 Motorola MR350 2-WAY Radios, 3 Dual chargers, 6 Ni-MH Rechargeable batteries, Manual. Twenty Call Tones The MR350 can transmit different call tones to other radios in your group so you can alert them that you want to talk. Choose from 20 different tones. Hands-Free Communication Use the iVOX feature to transmit hands-free without the need for any headset accessories. Once iVOX is turned on, the radio detects your voice and transmits when you speak into the internal microphone. QT (Quiet Talk) Noise Filtering The QT noise-filtering feature helps to ensure uninterrupted communication with other Motorola radios, filtering out unwanted transmissions from other radios. This is useful in places where there is heavy radio traffic, such as amusement parks or ski resorts. Weather Receiver Tune in to broadcasts by the United States National Oceanic and Atmospheric Administration (NOAA) Weather Radio and Environment Canada Weatheradio. Both NOAA and Environment Canada have transmitters located throughout the United States and Canada, respectively. These transmitters broadcast watches, forecasts, and other information 24 hours a day. Weather Alerts A special alarm tone sounds an alert and turns on the weather receiver to give you immediate weather and emergency information. Flashlight Handy built-in LED flashlight comes in handy in the dark or during power outages. Push-to-Talk (PTT) Power Boost When activated, this feature helps extend the transmission range by increasing the transmitter power output while helping to save battery life when no power boost is necessary. Extra Large Buttons Skiers and winter sports adventurists will appreciate the new design that features extra large buttons making it easier than ever to operate with gloves. VibraCall For quiet adventures or when ringing is intrusive, the VibraCall feature can be enabled to silently alert users to incoming transmissions. ALL ITEMS ARE IN GOOD WORKING AND COSMETIC CONDITION. What are the key points you need to look when choosing 2-way radio. Choose a two-way radio that will operate at needed distances, using higher wattage as the best indicator of transmission range. Remember that ranges are based on direct line of sight measurements, so buildings and natural features will reduce the usable range. Family Radio Service (FRS) radios allow for up to two miles of transmission, do not require a license and work right out of the box. General Mobile Radio Service (GMRS) radios have more range and channels and require all users to obtain an FCC license before they begin transmitting. Spending more will get you a two-way radio with more channels, which may be needed in densely populated areas. Look for dual-channel monitoring or channel scan for easier communications with multiple two-way radios and try to find a model that monitors weather and emergency channels. Better two-way radios use privacy codes that will keep outside conversations off your channel and scramble your conversations to keep eavesdroppers from hearing them. For business applications where privacy is essential, consider leasing a private channel and getting two-way radios that can use it. Most families will be happy with replaceable batteries for home use and occasional outings. Daily two-way radio users should look for kits with rechargeable batteries that can be refreshed in a docking station. Please visit our store for more great DEALS. In the event 2wayRus provides a repaired or replacement part, telephonic technical assistance will be provided. 2wayRus reserves the right to substitute functionally equivalent new, used or serviceable reconditioned parts or Systems. Now you won't have to worry about unexpected repair and service costs. It cover Parts and Labor for the entire term of the plan - and a no lemon policy guarantees if your item breaks more than 3 times, it will be replaced for free. Defective equipment will be covered by applicable warranties. We welcome any questions or comments you may have. We work very hard to resolve ALL issues to our clients satisfaction. YOUR SATISFACTION IS OUR GOAL!! We test every single item to make sure that you can rely on us! The item "6 Motorola MR350 MR560 FRS GMRS 2-WAY Radio Walkie Talkie Ni-MH Weather VOX QT" is in sale since Wednesday, March 27, 2013.